Between 1929 and 1941, the Communist Party organized and led a radical, militantly antiracist movement in Alabama -- the center of Party activity in the Depression South. 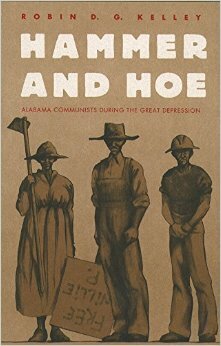 Hammer and Hoe documents the efforts of the Alabama Communist Party and its allies to secure racial, economic, and political reforms. Sensitive to the complexities of gender, race, culture and class without compromising the political narrative, Robin Kelley illustrates one of the most unique and least understood radical movements in American history. The Alabama Communist Party was built from scratch by working people who had no Euro-American radical political tradition. It was composed largely of poor blacks, most of whom were semiliterate and devoutly religious, but it also attracted a handful of whites, including unemployed industrial workers, iconoclastic youth, and renegade liberals. Kelley shows that the cultural identities of these people from Alabama's farms, factories, mines, kitchens, and city streets shaped the development of the Party. The result was a remarkably resilient movement forged in a racist world that had little tolerance for radicals. In the South race pervaded virtually every aspect of Communist activity. And because the Party's call for voting rights, racial equality, equal wages for women, and land for landless farmers represented a fundamental challenge to the society and economy of the South, it is not surprising that Party organizers faced a constant wave of violence. Kelley's analysis ranges broadly, examining such topics as the Party's challenge to black middle-class leadership; the social, ideological, and cultural roots of black working-class radicalism; Communist efforts to build alliances with Southern liberals; and the emergence of a left-wing, interracial youth movement. He closes with a discussion of the Alabama Communist Party's demise and its legacy for future civil rights activism.